With the actual experience of completing four blog posts, I am now clearer on how I can use this process to improve my own work as a sketchbook artist. I see that there are four core questions that are driving my thinking. What is my specific learning goal for the day and what work will I do to learn it? What did I actually do and what is the visual evidence for this? What did I learn, how did I learn it and what else do I need to learn to accomplish my specific goal? What else am I thinking that is relevant to my goal of communicating ideas by using images? I will use these prompts as a structure for my blog. Today I plan make numerous sketches of people emoting. I will draw quickly and try to capture through body language something that they appear to be feeling. Here is a woman listening to a lecture. I communicate her alert attention to the speaker by having her sit up straight and look directly forward. 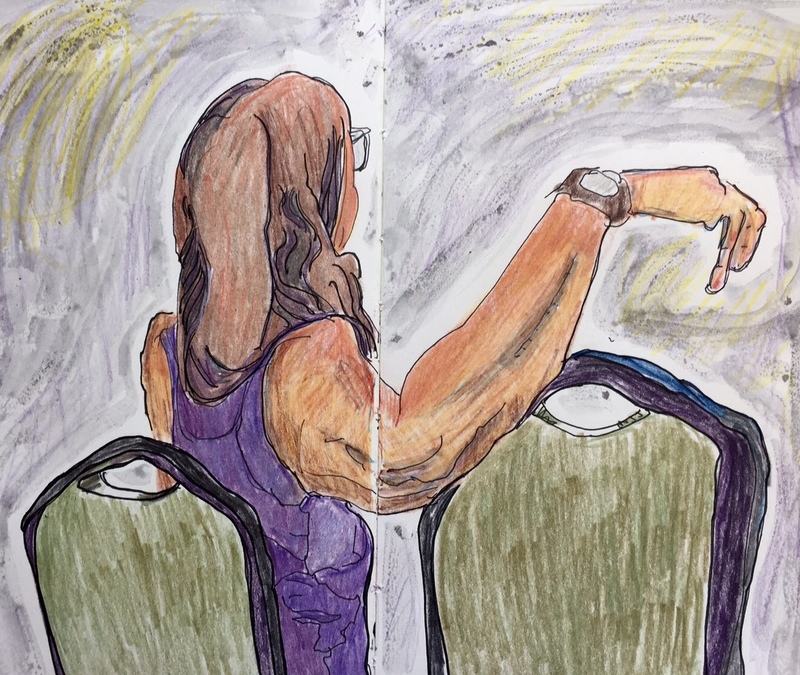 From her wonderful, relaxed (and way too large) arm, I think I communicate her calm comfort with the content of the lecture. Today I watched the model before drawing and think this helped me decide on a few key characteristics to focus on. I wonder if it would have been better to include the speaker the woman was listening to, so we could see who was the object of her attention. This entry was posted in Deliberate Practice, Uncategorized. Bookmark the permalink.